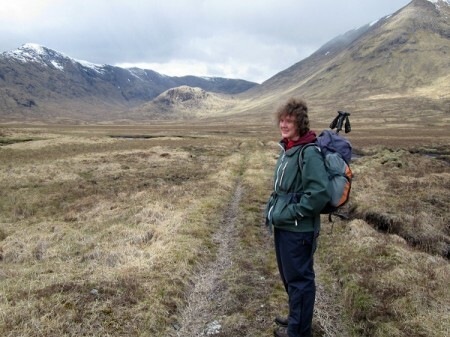 A tale of two Meall Tionails …..
For anyone out there who reads these blogs, you might remember that about a year ago I wrote about my plans to walk a wee hill tucked away amidst the bigger mountains of the Blackmount. 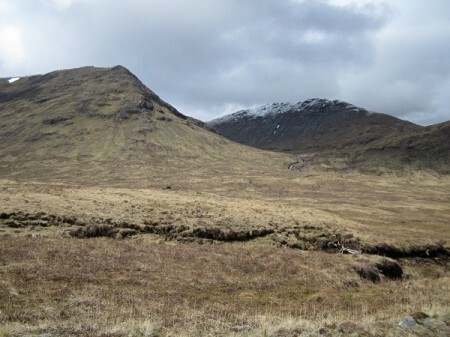 The hill in question was Meall Tionail …a rocky little hillock of just over 500m in height. We’d been planning to walk this hill ever since my partner Anita saw it from one of its bigger neighbours and said that she’d like to sit and eat her sandwiches at the top of it one day ….it really is in a wonderful location, surrounded on three sides by bigger dramatic mountains and looking out on the other side to the expanse of Rannoch Moor. Suffice to say that we didn’t make it last year as planned and so it had to wait until Monday this week before we finally got to go there. With a pretty good forecast and following a reasonably dry period (the walk in involves crossing several streams) …it seemed the perfect place to go ….and so I rang our friend Guy to see if he wanted to join us. Wanting to walk a tiny hill in the middle of much bigger ones seemed to be a daft enough proposal to him and he was all for it ….we’d pick him up from the station at half past six the next morning. 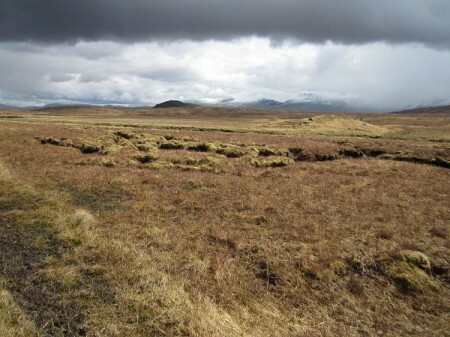 Meall Tionail is as I say, just a small hill …it’s the getting to it that takes the effort. We chose to park the car at the Glencoe Ski Centre and walk the West Highland Way back south to Ba Bridge, then follow a path up the side of the river for around three miles to the summit of the hill…..I guess in total (though I haven’t made any accurate measurements ..about 13 – 14 miles for the day ….with a few hundred metres of ascent thrown in for good measure. 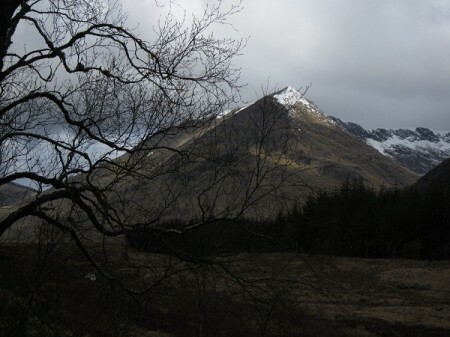 The weather was indeed, pretty good, the cloud was quite high and all of the bigger tops were clear …the upper slopes white with snow and looking very dramatic. The sky was a mixture of dark clouds and bright sunshine and it made for some wonderful views and a great range of colours. Needless to say we did a lot of stopping to look and snap away with our cameras and time went by faster than the miles under our boots. Thankfully the path up the glen by the river proved a good one with small bridges over the numerous small streams. At one point though the path appeared to disappear….and we were left scratching our heads and pawing over the maps ….we were confronted by a sizable stream and no sign of the path on the opposite bank. Nothing for it but to splash our away across ….thankful now for the dry weather over the preceding weeks….and still we couldn’t figure out quite where we were or where we’d gone wrong. We could see our hill though and on heading towards it and back towards the main river found our path …quite how it had got there was a bit of a mystery! Lunch, but not at the top! At around this point we’d been walking for about three hours and we still had a good distance to go to the base of the hill …let alone climb the thing. As we’d set out at 9.15 am, it was looking like being a late finish…..much to my dismay there were murmurings in the ranks that perhaps we’d only get to the base of the hill. In all honesty though we were running a little late and when we got to the base of the hill we did in fact decide that that was as far as we could go ….ahhhhhh, after all these years waiting to come here and the long drive and the four hours walk in …and not to get to the top …well, it was a bit galling. We could have got to the top and back down to the car before it got dark …but we’d have had to have rushed it which was completely against the whole idea of going there in the first place. Nothing for it but to return some time in the future …and allow more time. We’d had a great day and seen some wonderful scenery, but I hadn’t realised how disappointed Anita was at not getting to sit and eat her lunch at the summit. When we finally got home she said, ‘how about going back on Wednesday …the forecast is almost as good?’ I saw from her face that she wasn’t joking …and well, we haven’t done anything as daft as that for a long time …so Wednesday was booked and with an extra early start …up at 03.50, out and away from Irvine at 05.15! Mad or what?! This time though the weather wasn’t as good as the forecast had predicted and on reaching Loch Lomond it started to rain and both the Luss Hills and Ben Lomond disappeared into a grey wet slurp. 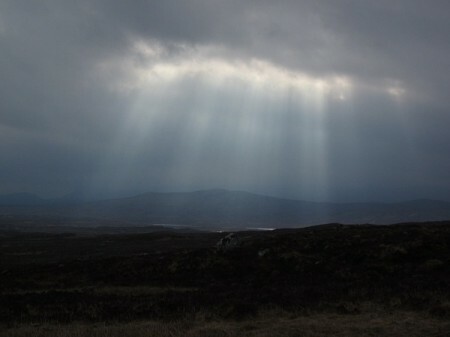 It continued to rain all the way to the edge of Rannoch Moor where at last we saw a few bursts of sunshine over to the east. The mountains were all shrouded in mist and it was a very different scene from just 48 hours earlier. This time Anita and I started walking at 07.50 and with fewer things to photograph and less stops we made good time. It stayed dry all the way to Ba Bridge but after that the rain came back …and stayed for the next almost eight hours. The beautiful snow covered and dramatic peaks bursting with colour in the bright spring sunshine of just two days earlier, had been replaced by an equally beautiful scene of dark brooding hills disappearing up into the cloud. It was cold and very wet …but we could see our little hill up ahead …its summit well below the cloud base ….one advantage of climbing a wee hill! 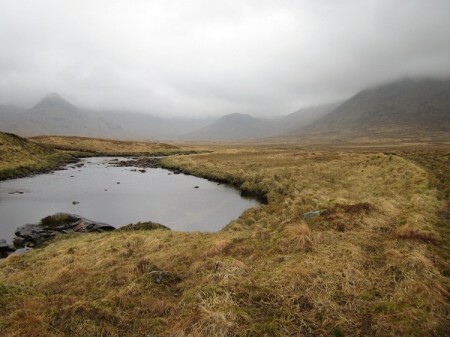 We arrived at the base of Meall Tionail and after a brief stop headed uphill on a mixture of grass and stone, crossing numerous small streams that were coming to life again with all the rain. By this time the wind had picked up and it was blowing the rain along in sheets, but as we reached the top of the hill, it really didn’t matter …as Anita said, ‘This is even better than I had imagined’ …and indeed it was. The summit is topped by a series of crags …the outer edge like battlements of an ancient castle …the views out over the glen towards Rannoch Moor quite stunning even in this wild weather. Big mountains rose all around us, occasionally giving glimpses of the snow covered ridges for the most part hidden in cloud. Wow, what a spot. Anita did finally get to eat her sandwiches on the top, albeit hunched against the wind and driving rain ….but what the heck …we’ made it and it felt very special. 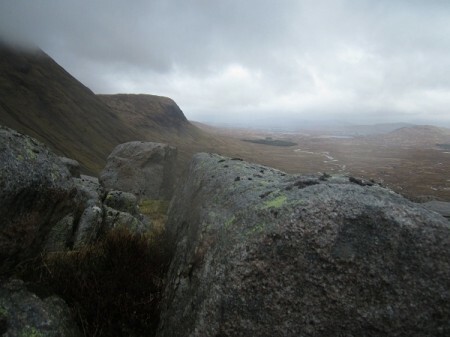 From the summit of Meall Tionail....at last!